Audi Q7 – Style, prestige, comfort and luxury – that’s what the full-size Audi Q7 luxury SUV offers – along with seating for up to seven. The diesel model is powered by a 221-hp 3.0-liter TDI V6 engine mated to an automatic transmission. 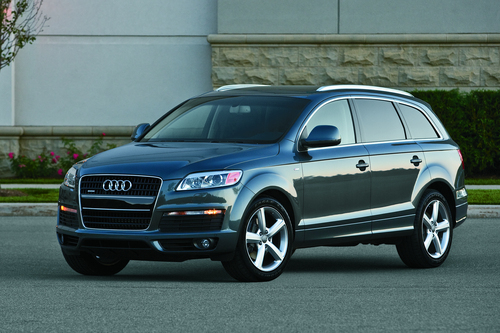 Automobile Magazine comments, “The Q7’s 3.0-liter TDI diesel V-6 is a winner. It’s so quiet, so smooth, and so powerful…Cruising at 80 mph on the freeway is effortless, and if you gun it to 90 mph or higher on the highway when you’re passing, it’s as if the engine is not even exerting itself. The powertrain is also very smooth and refined at slower, around-town speeds.” Due to its tapering roofline, however, the third row is suitable only for children (or small adults). Mercedes-Benz GL350 BlueTEC – The 7-passenger large luxury Mercedes-Benz GL350 BlueTEC features a 3.0-liter diesel-powered, turbodiesel V6 – and 50-state-legal clean diesel technology. Producing 210 horsepower and attached to a 7-speed automatic transmission, GL350 BlueTEC also has standard 4Matic all-wheel drive. Note that the 350 replaces last year’s 320 moniker. EPA fuel economy is estimated at 17 mpg city/23 mpg highway. Edmunds says, “A diesel in this sort of vehicle makes a lot of sense, delivering ample torque around town and excellent fuel economy for a big luxury SUV…No other luxury SUV provides the same balance of driving refinement and interior space as the 2010 Mercedes GL-Class.” Its power fold-flat third-row seat makes transforming it from people to cargo hauler a breeze. Why aren’t there more large diesel-powered SUVs with three rows of seating to put on this list of Best Large Diesel SUVs with 3rd Row? Sadly, although there has been talk of adding diesel engines to other cars, automakers haven’t come through – yet. For now, take these two for a test drive or, if you still want a diesel SUV, don’t need a third row and can move down a bit in size, check out the Volkswagen Touareg TDI.